In today's Urban Planner: festivals by the water and in the park; retrace the steps of an American invasion; two improvisers, one hour, one scene; and rap both semi-serious and not-at-all-serious. 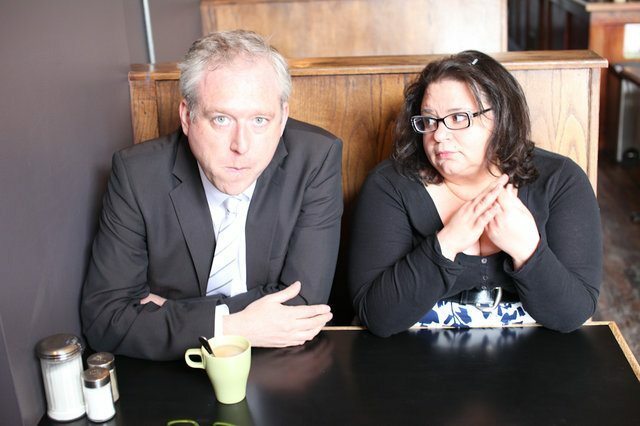 Master improvisers Rob Baker and Jan Caruana play an hour-long scene tonight in That Moment When. Photo by Dan Abramovici. FESTIVAL: In this heat, along the water is the coolest place to be in Toronto, so it’s perfect timing for the Redpath Waterfront Festival. With a focus on East Coast and maritime culture and tradition, the festival includes tall ship tours, beach jams, a nighttime “water light show” at Sugar Beach, and a “kitchen party” with food and music. Various locations along the waterfront, to Sunday, 10 a.m.–10 p.m., FREE. FESTIVAL: If you’d rather be festive in the park (and in the shade), the annual Dufferin Grove Cooking Fire Festival opened earlier this week. With puppet shows, original theatre, organic firepit cooked meals, and more, there’s plenty for everyone to enjoy. Dufferin Grove Park (Dufferin Street & Dufferin Park Avenue), to Sunday, 6 p.m. onwards, PWYC. HISTORY: The War of 1812 is what’s being celebrated this year at Historic Fort York, but it wasn’t the only major battle fought on the site. The Fort successfully repelled an invasion force of 2,000 American soldiers in 1813, and this evening, Heritage Toronto will host a free walking tour of the invasion route. At the end of the walk, you can take the chance to explore The Encampment—which works out to be at dusk, which is when the exhibition looks its best. Dufferin Gate (160 Dufferin Street), 7 p.m., FREE. A trio of local rappers—Timbuktu, Chokeules, and Savilion—have teamed up as Swamp Thing, and are releasing their first EP together tonight at monthly throwdown $5 Rap Show, also featuring Ghettosocks and Wordburglar. These guys take their rhymes seriously, but they’re also known to have a bit of fun in their videos and shows—like dressing up in a jackalope costume. Rancho Relaxo (300 College Street), 9:30 p.m., $5. Tonight’s also an edition of the popular (and now, Canadian Comedy Award–nominated) Rap Battlez, featuring the return of popular characters like Actual Dracula (Jon Blair) and CannaBill (Alex Tindal), plus birthday celebrations for co-host Dext Vocab (Freddie Rivas). Comedy Bar (945 Bloor Street West), 10:30 p.m., $10.